Before you need to reboot a VM, or do some destructive maintenance on there, it is a good practice to at least tell the user(s) of that VM what is going to happen. But how do you address the users of a VM? They can be connected to a console (local) or via a RDP session (remote). And how do you get their reply back? Exactly such a question appeared in the VMTN PowerCLI Community recently. And after some digging, it seems that is possible through a PowerShell script that uses the Remote Desktop Services API, provided through the wtsapi32.dll. Note that the VMs we are looking at, all are running a Windows guest OS. Finding out which performance counters are available on your vSphere server over which time interval, is not always an easy task. There is of course the Performance Manager entry in the VMware vSphere API Reference, but that is not always the easiest task. Let alone finding out what a specific counter actually represents. For that reason I decided to create a tool, which I called the Stats Toolbox, that would query the vSphere server to get the actual list of counters it collects for each interval. In the tool I added some extra features that would make working with the performance counters easier. During our VMworld 2014 US breakout session I demonstrated the features of the Stats Toolbox, and I received quite some positive feedback. 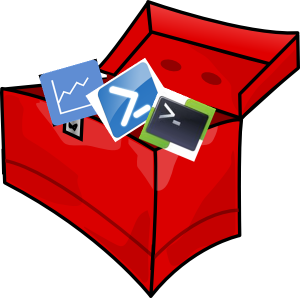 My favorite PowerShell editor is free now! I rarely post about products, since I want to keep my blog “technical“, but there was some big news from Idera today. 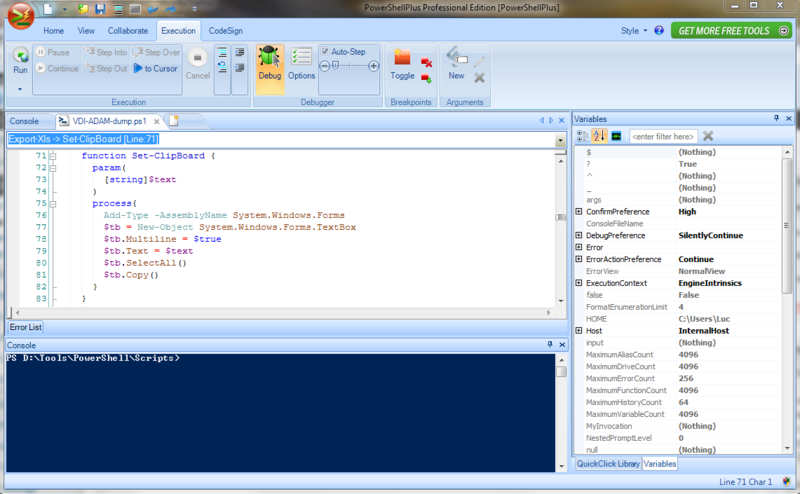 As from version 4.6, their famous PowerShell Plus editor is now a free tool. This is the editor I have been using to write, and debug, my PowerShell and PowerCLI scripts since day 1. It would take me several pages to list the features I like and use in PowerShell Plus, but there are 2 that were ‘love at first sight’ for me; the Debug mode and the Variables pane. You can’t go without those when you are writing a script. It happens quite often that you launch a PowerCLI cmdlet or a call to a SDK method or a script and that you get a rather cryptic message that something went wrong. One source of information to find out what went wrong are the vCenter’s vpxd log or the ESX(i) server’s hostd log. But these logs are flooded with messages and it’s often quite hard to find the messages that relate to your task. When running against a vCenter Server you can set the vCenter’s Logging Options to “Verbose” or “Trivia“. That produces more information in the logs but that often also makes it harder to find/extract the information that belongs to your task. And who has never forgotten to set the the Logging Options back to their original state when done with debugging ? To make life a bit easier, I wrote a function that automates the above steps. I expanded on a function that I was using privately, and made it more general. This function allows you to retrieve the log entries for one specific or all recent task. The function also allows you to pass a cmdlet, or even a complete script, run the script in an elevated Logging Options mode and returns the task-related log entries. One of the announcements during VMworld 2010 in San Francisco that perhaps got a bit obscured by the other “big” announcements, was the release of Onyx 2.0. For those of you that hadn’t heard of Project Onyx before, this nifty little tool captures all SOAP traffic that is passed between your vSphere client or PowerCLI session and the vCenter or ESX(i) server to which you are connected. And that’s not all, the Onyx program will translate the captured SOAP traffic into PowerShell code. This allows you to see which vSphere APIs are used and how parameter objects for these methods are constructed. 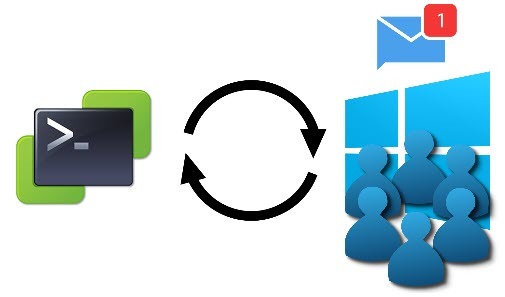 Update September 16th 2010: the Onyx Development Team has just released a new build (2.0.3910.32223) that fixes some issues when using Onyx with the PowerCLI client. Congratulations to the Onyx Development Team for this quick resolution of the problem ! There was another interesting question on the PowerCLI community. Mike was wondering if it would be possible to change the VMware Tools scripts with a PowerCLI script. 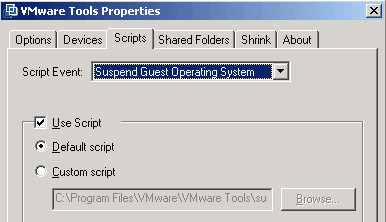 As far as I can see there are two options available with the VMware Tools scripts. To use the 2nd option you will need, as William already pointed out, the VIX APIs. But if you can live with the first option, and reuse the default scripts, the current PowerCLI build has all you need.